Facebook Messenger has over 1.3 billion monthly users, making it an ideal platform to connect with the people interested in your company. Good customer service requires your conversations on Messenger to be effective and to leave a good impression of your brand. Surveybot’s chatbot surveys can easily help accomplish both of these customer service goals. Once your personal conversation with a user comes to an end, you can easily trigger a customer satisfaction survey. All you have to do is type a keyword and your survey will be sent. This allows you to quickly and easily measure the effectiveness of your conversation. Using chatbot surveys on Messenger means you do not have to switch to another platform to send surveys or answer requests. You can do all your work from one platform, saving you time and effort. Surveybot’s surveys have an open rate of around 80%. When is the last time you sent a customer service survey over email with that type of open rate? 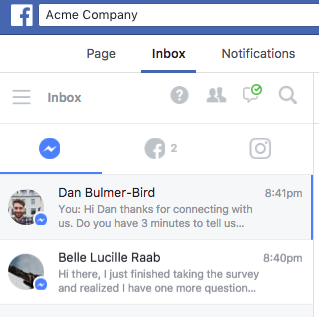 Sending chatbot surveys over Messenger is an easy way to engage with your customers on the platforms they are already using. You don’t have to see all the messages exchanged in a chatbot survey conversation. 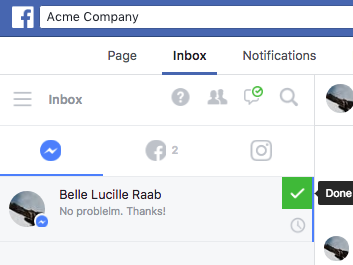 You can set up your Facebook page inbox to only receive messages that your bot cannot handle. This makes it easier to identify important messages from your customers. To learn how to hide chatbot conversations read this article. Facebook Messenger is increasingly becoming a popular channel to engage with customers. Make sure you have all the tools you need to have the most effective customer service conversations possible. Try using Surveybot’s chatbot survey on Facebook Messenger today!